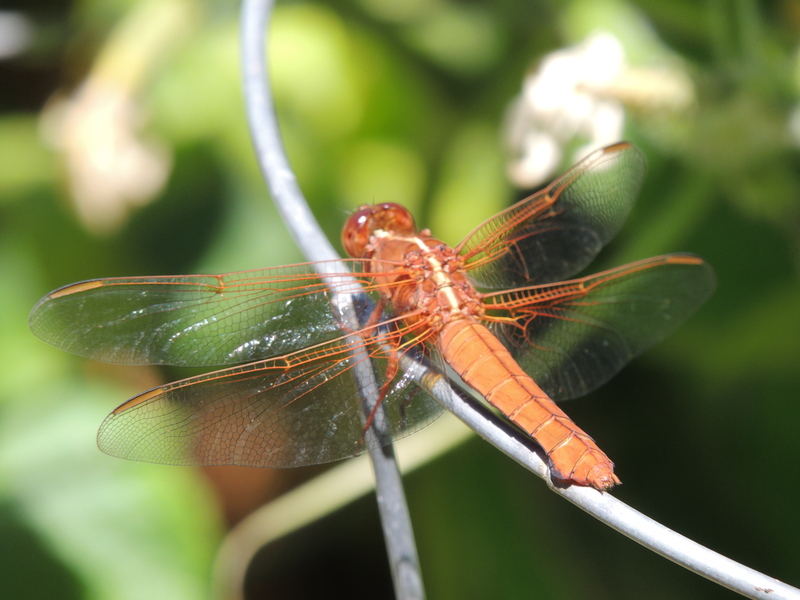 Posted on June 29, 2012	by Lou Murray, Ph.D.
A red dragonfly in my garden. 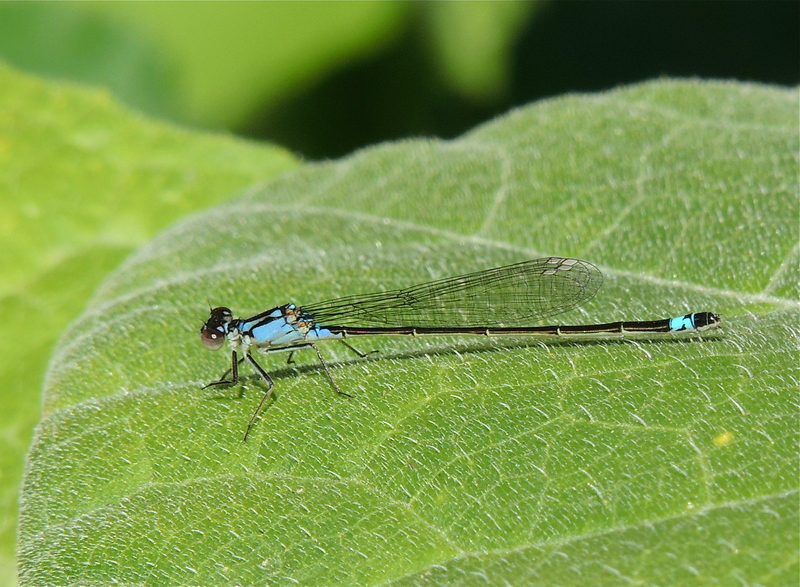 And a blue damselfly on a squash leaf. Well, I’m learning my camera and computer. I managed to rename my photo file as I uploaded it from camera to computer, managed to find the file and process the photos in iPhoto, and even managed to find the photos from WordPress, but I can’t find the processed photo files. Oh well, more to learn. We’ll just go with what we have because I’m pressed for time today. There. I managed to find my processed files. I’ll probably never be able to duplicate this feat. It’s Kitchen Cupboard Thursday, and my husband finished off the last of a jar of lemon-ginger marmalade. There is plenty more of that on the shelf though. However, we’re down to our last jar of bread and butter pickles, and I’m wondering if the inch-long cucumbers will be ripe in time to make more pickles before the jar is empty. I planted a LOT of cucumbers this year, so I hope they bear fruit. 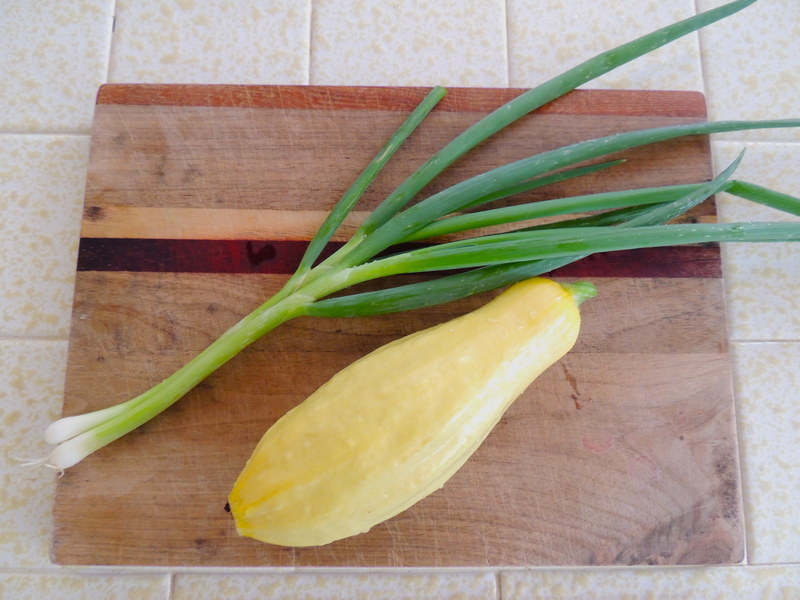 I have a lot of yellow squash these days, and the green onions are growing as fast as I pick them. The squash and green onion went into a really easy side dish. Saute the squash and green onion and some garlic in olive oil until lightly browned, splash on some good vinegar like basaltic, and top with Parmesan cheese. Serve with pasta. 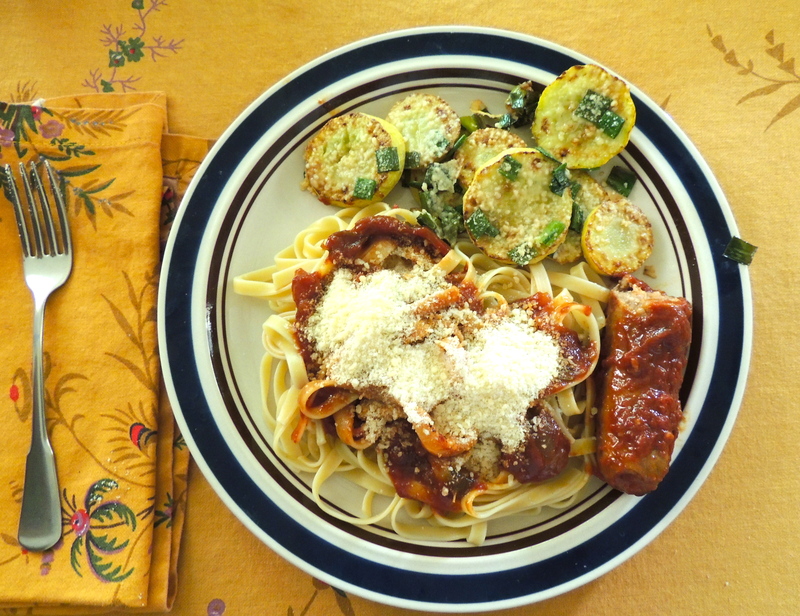 This marinara sauce is from our home-canned stores. 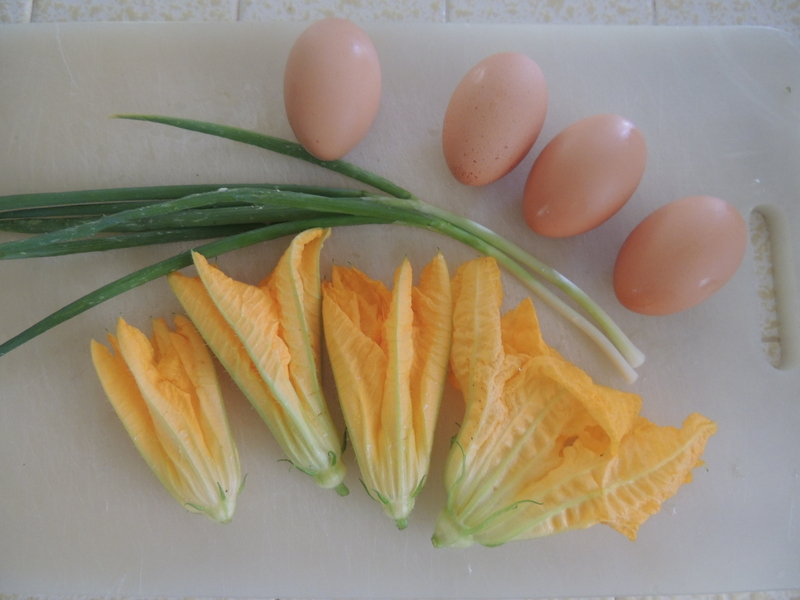 These are the ingredients for squash blossom scramble. Pick male squash blossoms (no tiny green squash at the base of the blossom). Wash off the bugs, and there will be bugs! Chop the blossoms including the base, and the green onions. Saute the blossom and green onions until the blossoms are wilted and the onions turn bright green (I use bacon grease in the skillet). Add the eggs and stir quickly until eggs are nearly done. Add some diced cubes of cream cheese, about 2 T and stir in. Heavenly! This is squash blossom scramble. Serve with toast and whatever fruit is in your garden. I’ve begun to harvest my blue potatoes. This is one of the squash that grew on my “mystery pumpkins” that sprouted from the compost pile. 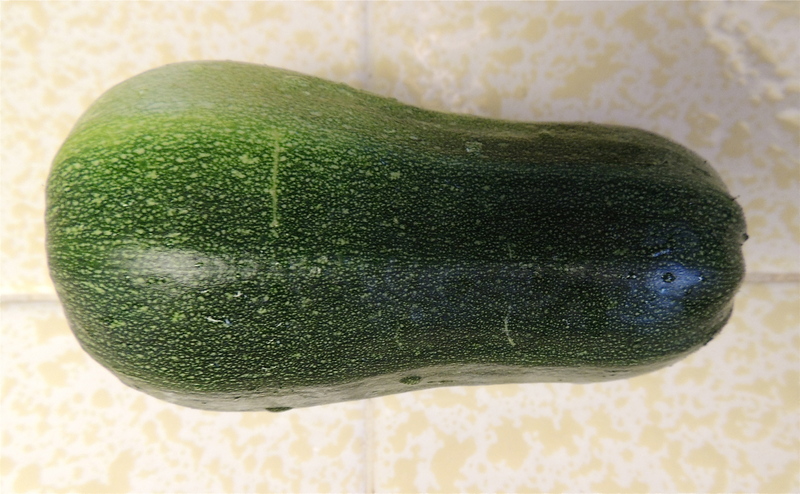 It’s just a zuke. 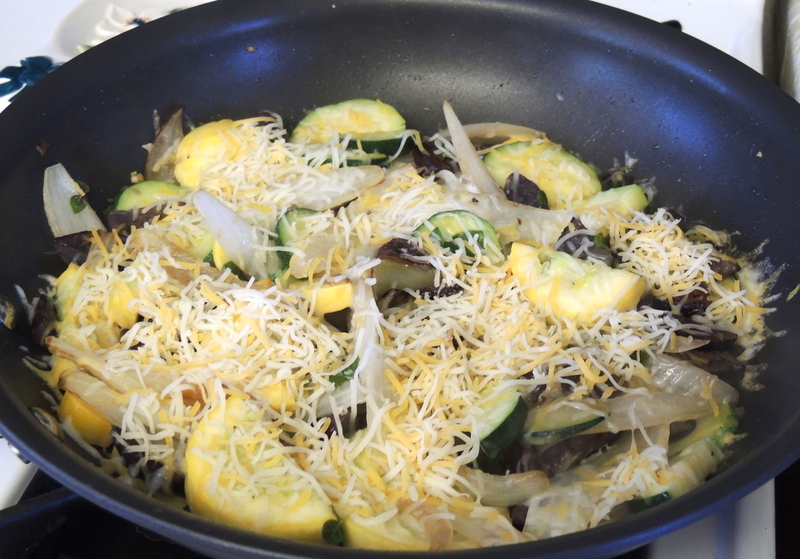 I made lunch with the blue potatoes, a yellow squash, the zucchini, an onion, and some garlic. Sauteed them in bacon grease until done, then added some grated Mexican cheese at the end and let it melt. Still not done, see next photo. 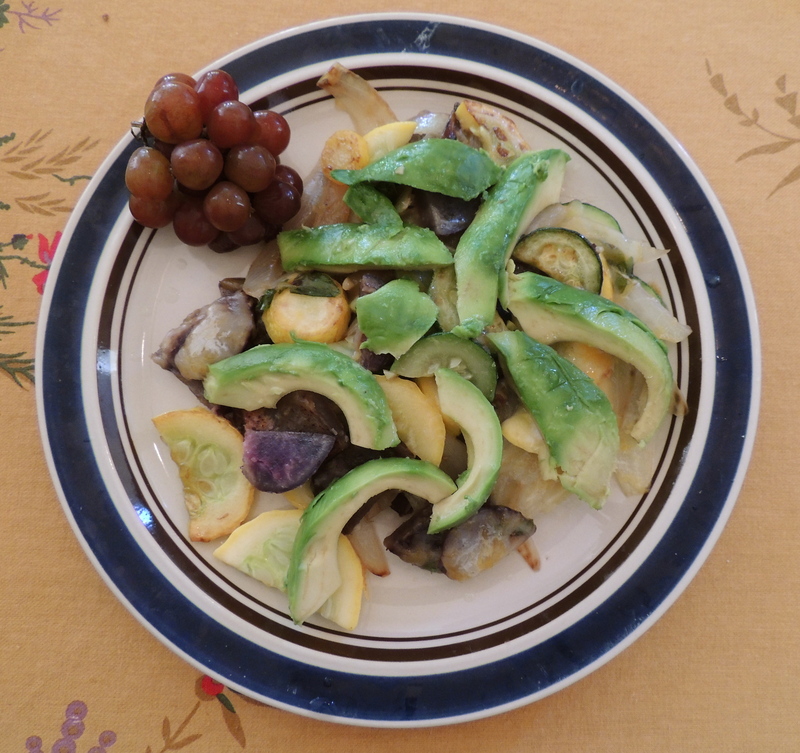 I sliced a ripe avocado onto each plate and squeezed lemon juice on top. It was a strange dish, but filling and delicious. The avocado and lemon were both from my garden. I’m not going to have any photos to show on harvest Monday. 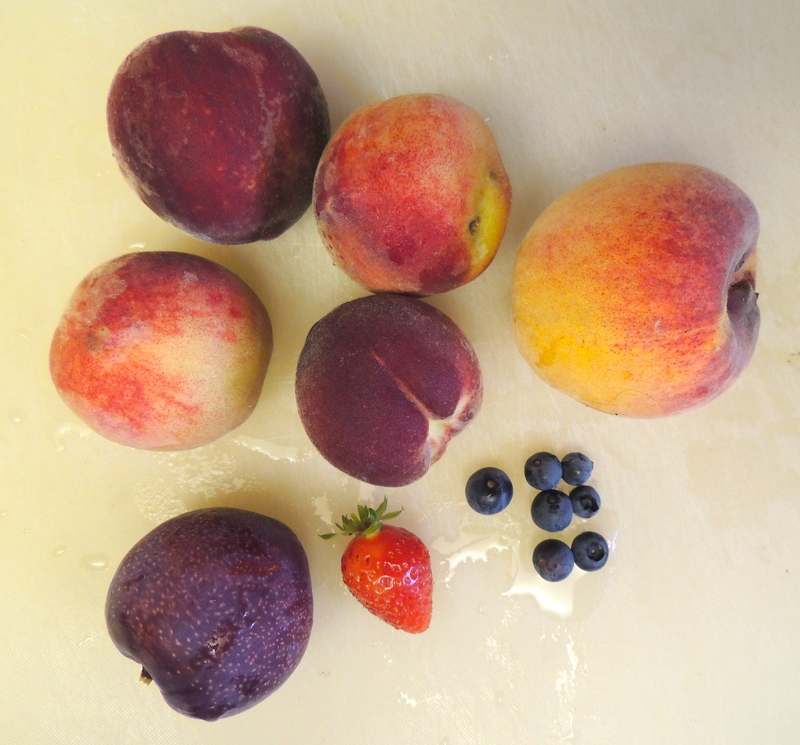 Here is one day’s fruit harvest, with the last August Pride peach and some of the Babcock peaches, the first Santa Rosa plum at the bottom, one strawberry and 7 blueberries. Don’t laugh. 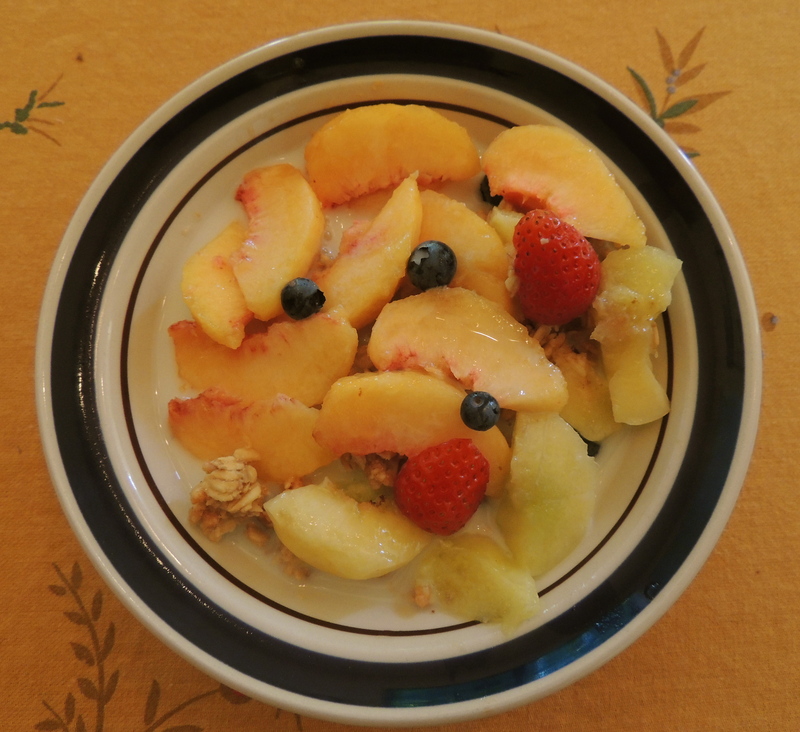 Most of the fruit goes onto cereal for breakfast or ice cream for dessert. The Babcock peaches are translucent with a greenish tint with an unbelievable floral scent that is out of this world. I am out of time. Gotta run. 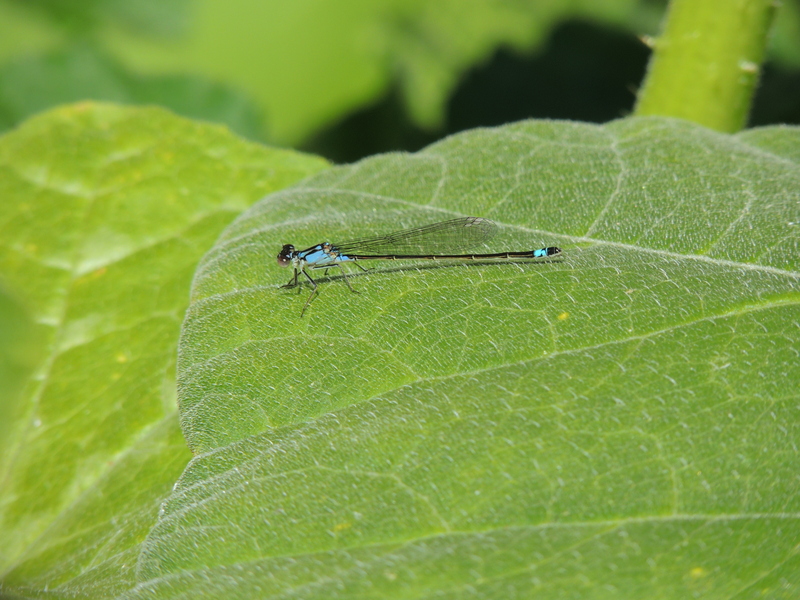 If you want to see how others are using their harvests, visit Robin at the Gardener of Eden. 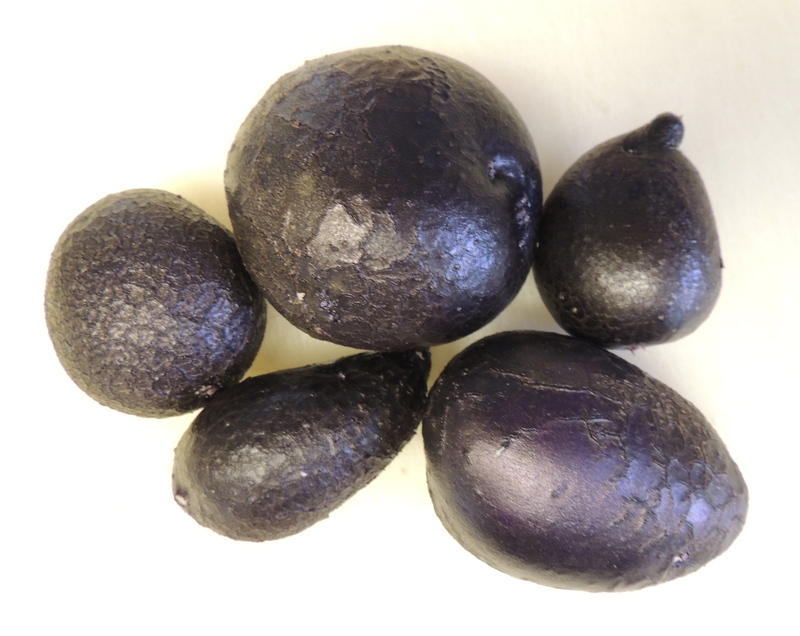 This entry was posted in Uncategorized and tagged blue potatoes, dragonfly, Kitchen Cupboard Thursday, photos, recipe, summer squash. Bookmark the permalink. 10 Responses to Thar be DRAGONS! Looks like a nice harvest tastily prepared. Your squash flower scramble is very original. I bet it was delicious. Jody, Daphne, and Robin, the male squash blossoms make a delightful addition to eggs. They’re good stuffed too, but I don’t usually cook them that way. Last year I put squash blossom in my eggs too. None so far this year though. I do have two open females on my zucchini ,but nothing to pollinate them with. I might pick them as blossoms tomorrow if I can remember them in the morning. The squash blossom scramble sounds wonderful! “The Italian” always talks about how his grandmother used to fry squash blossoms. 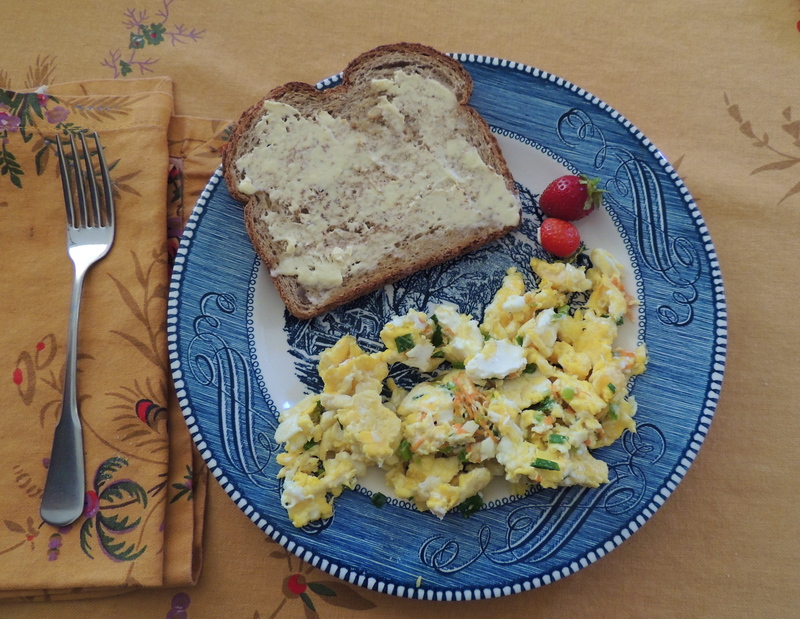 Thanks for the recipe for the squash blossom scramble. I’ve wanted to try using some squash blossoms for a while now so I will give this recipe a try. We should start having blossoms any day now and heaven knows we don’t have an egg shortage around our place. Clare, only use the male blossoms for cooking. Unless you’re trying to reduce your squash harvest. Perfect shot of the red dragonfly. Must make your squash blossom scramble when I get some male squash blossoms. Bet the flavors of all those tree ripened fruits are out of this world. Norma, we are being really spoiled with our own tree ripened fruit. I just wish that there was more, and that things didn’t get ripe all at once.